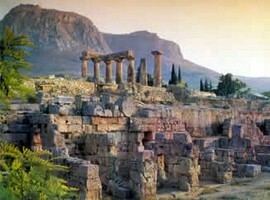 Ancient Corinth was one of the largest and most important cities of ancient Greece. 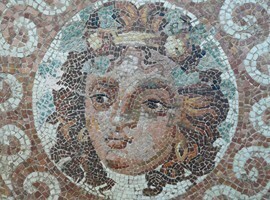 Inhabited in the Neolithic Age, the origin of its inhabitants was not clarified. 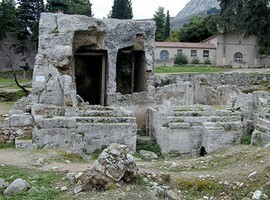 The ancient city of Corinth was built in the plain below the fortress of Acrocorinth. 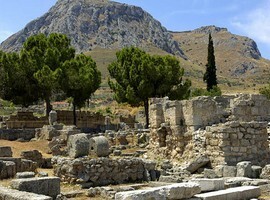 The ruins of Ancient Corinth are located 9 km south of the modern city. The entrance to the site is now at the southwest side. 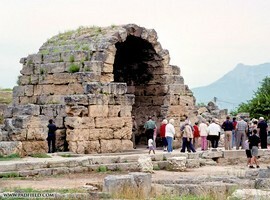 From the entrance head to the central market area which in antiquity used to be entered by the Lecheos Street. 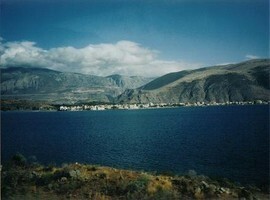 The street connected the city to the port at the Corinthian Gulf. 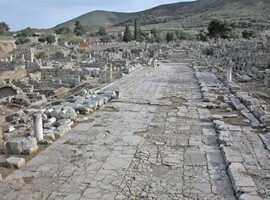 This was a wide paved street, flanked by shops that opened beneath Corinthian porticoes. Today there are a few of them in good condition. At the end of the road there was an impressive porch, upon which the gilded statues of Sun and the Phaeton were erected. 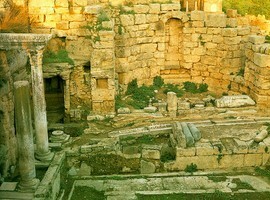 East of the entrance there are the remains of the Peirene fountain, used from antiquity to the late 19th century. Descending to the courtyard of the fountain which was adorned by Herodes Atticus during the second century AD, there are six pumping tanks communicating with a 400 cubic meters capacity large tank. 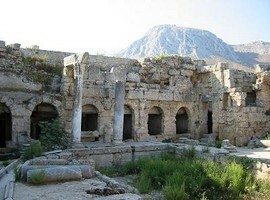 According to legend, there were two fountains of Peirene: one at the top of Acrocorinth and the other at the foot. 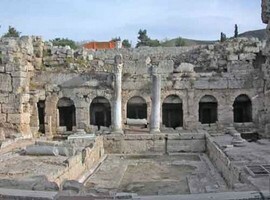 North of Peirene is the precinct of Apollo, which consists of a courtyard surrounded by lodges. 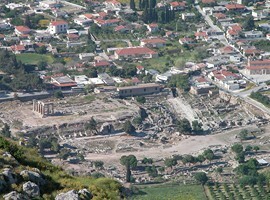 According to Pausanias, the precinct housed a statue of Apollo. 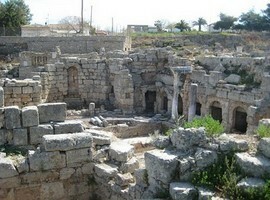 Nearby there are traces of baths built in 5th or 6th century on the ruins of which the Roman baths were built. West of Lecheos Street, you will notice the foundations of a great Roman basilica, originally built on limestone and then rebuilt in marble. In the ancient market there are still several public buildings of the Roman times, galleries and ruins of temples (Athena, Hera, etc.). 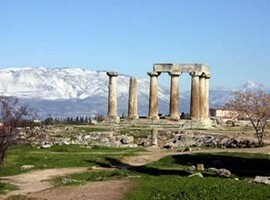 The most important monument is the temple of Apollo, which rises at a low hill to the north of the market and is one of the greatest temples of archaic Greece. 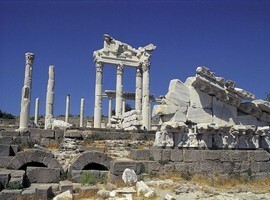 It was built between 550 and 525 BC in place of a temple of the 7th century, in the form of a Doric temple pavilion. 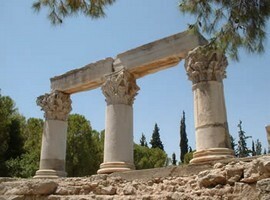 From the temple, the most attractive monument of ancient Corinth, only seven monolithic columns out of the 38 who supported the cloisters are still standing. The whole shape of the temple can be seen through the notches made in the rock in order to place the foundations. Behind the town rises the towering of Acrocorinth, built on the 575 meters tall rocky mountain, on top of which was always the fortified citadel of Corinth. Its entrance lies to the west and here is where the modern road ends. 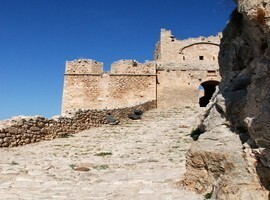 The Acrocorinth is not only the largest but also the oldest fortress in the Peloponnese. 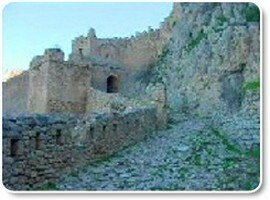 Its imposing walls belong almost entirely to the middle Ages, even though there are Turkish additions made. The medieval fortress was built upon the ancient one. 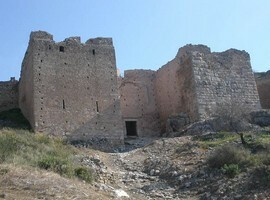 The castle was connected with the history of Leo Sgouros, who committed suicide by falling from the walls on horseback in 1210 in order not to surrender the fortress to the Franks, who held it until 1460, when it was taken by the Turks, while it was occupied by the Venetians at small intervals. 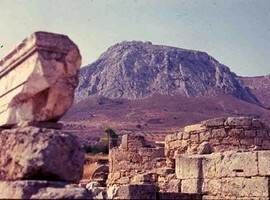 The Acrocorinth continued to be inhabited until the last years of Ottoman rule. The top of the hill can be reached by passing three successive gates, dominated by elements of Frankish architecture.